Why do dumb things often happen in smart companies? … people continually expand their capacity to create the results they truly desire, where new and expansive patterns of thinking are nurtured, where collective aspiration is set free, and where people are continually learning to see the whole together. When it comes to planning, in my experience, the five disciplines are extremely important. Indeed mental models, our paradigms built out of our own environment, experiences and prejudices, can and often do come into play when working on strategy development and business model innovation. the result often is a lack of innovation, risk taking and strategies which fail to meet the needs and wants of the market. Systems are complex and need careful consideration when we are moving in new directions. A simple change to one aspect will have multiple impacts internally and externally in any organisation. The best people to help develop and innovate are those who will be implementing a new direction. Working with all stakeholders in a collaborative and learning environment can minimise the risks associated with new decisions. Having worked in teams where all five disciplines were in place, (even though we didn’t know that at the time), I know from experience that the amplified energy of such an environment can and does lead to truly great outcomes. Using a structured approach, applying Senge’s thinkings, building shared vision and keeping an open mind can avoid predictable patterns and can elicit ideas that would otherwise never see the light of day. The golden circle is a great model developed by Simon Sinek. It talks about people buying why, not how your product or service is different or what your product or service is. People buy from you or engage with you because of your why, your passion, your reason for being in the market, what excites you and your staff. It is this real difference in your business model that gets you to the top and keepsmyou there. The world is full of companies selling similar products for similar prices. Today more than ever new ideas, new products and new services have a short shelf life. Smartphones are a classic examples. But organizational culture is a different matter, this is the true differentiator. Competitors, existing or new, can copy your business in every respect (patents and IP excepted) but they can’t copy your culture! Well not unless they buy the company and change nothing, a pretty tall order indeed! So I recommend watching the video and working on your own golden circle. And if you want to know more or discuss how to use this to energise your organisation we would love to share our passion for success with you. Contact us via one of the links on this page. If you have been following this blog for a while you would know that I am a strong advocate of the shifts in business ecosystems. There are lots of case studies of companies/products who got stuck in a rut never to live to serve their customers long term needs. One of the ways of moving from current paradigms to future thinking is to undertake planning and innovative thinking using the Business Model Canvas invented by Alex Osterwalder. I am a strong advocate of this system and use it widely with many different types of organisations. This is one of the easiest models to understand and therefore is a great tool as an introductory exercise at a planning workshop. It gets groups thinking about the important things such as customers real needs, revenues or benefits derived and mechanisms for delivering value. Further it doesn’t have any of the negatives of old fashioned business environmental assessment and can be a lot of fun for participants. A workshop where people participate, have fun and get real answers, who wouldn’t want that? Want more info then just get in touch. We love working with people who believe there can be truly great outcomes and want to part of the team that makes them happen. There are many ways of taking a “helicopter” view of the envirnoment you operate your business in. One of the ones I like best is the “force field” model, a management technique developed by Kurt Lewin which he used to describe individual and group behaviours but which here is adapted to organisational behaviours. 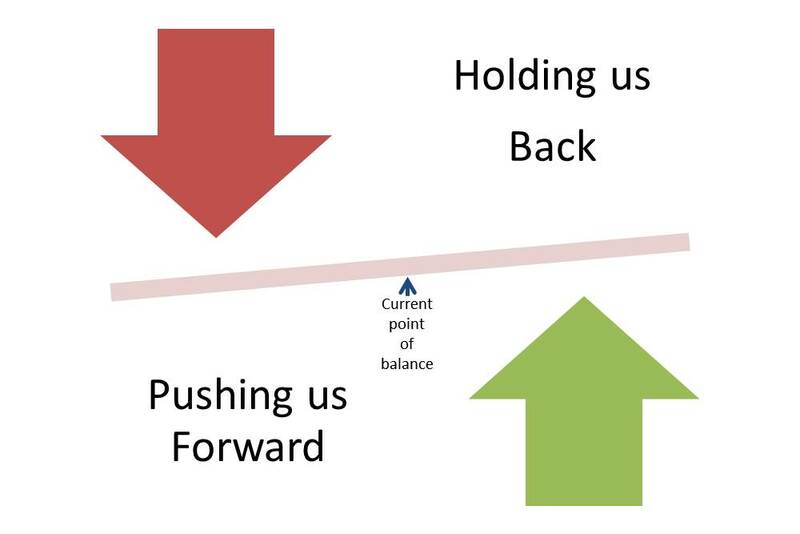 “Force Field” asks two simple and distinct questions – what is pushing us forward versus what is holding us back as an organisation or business unit? The two opposing forces cause the organisation to be sitting at it’s current equilbrium point, set by the relative levels of the two sets of forces at the point in time that the analysis is done. I like this approach because it allows you to intermix internal and external issues, avoids the “negativity” that inevitably exists with other more classic approaches, eg SWOT and can provide an excellent visual for workshop participants who are tasked with considering the questions. I find a lot of clients who have been SWOTed too many times! This approach works. Everyone “gets it”, it can be quite fun to play with and they happily participate. Once you have the answers to the two questions you can then set about looking at strategies to maximise the positives and minimise the negatives. And you can more easily discuss with the group where the return on investment in each of the strategies can be best extracted, ie how much effort will it take to change each force and how much difference would it make? And you can look beyond the forces on the balance point now as opposed to those that might emerge within the planning timeframe. Try it I think you will like it. If you want to know more contact me at groupstrategy@comcen.com.au and I would be happy to discuss how it can work for you.